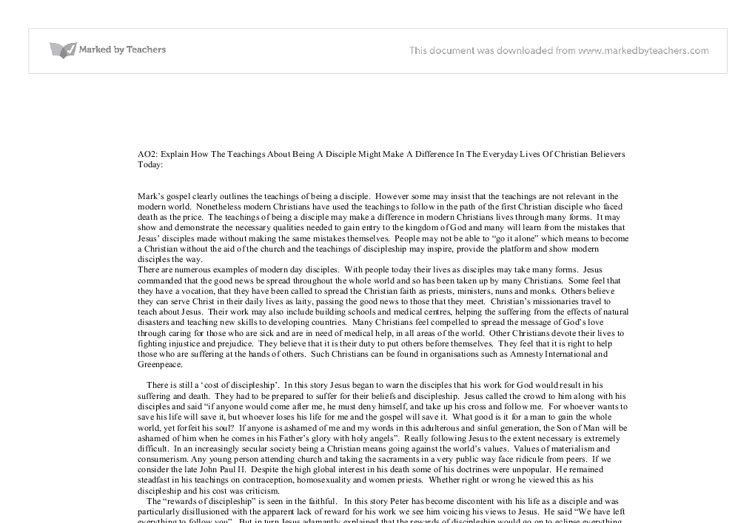 AO2: Explain How The Teachings About Being A Disciple Might Make A Difference In The Everyday Lives Of Christian Believers Today: Mark's gospel clearly outlines the teachings of being a disciple. However some may insist that the teachings are not relevant in the modern world. Nonetheless modern Christians have used the teachings to follow in the path of the first Christian disciple who faced death as the price. The teachings of being a disciple may make a difference in modern Christians lives through many forms. It may show and demonstrate the necessary qualities needed to gain entry to the kingdom of God and many will learn from the mistakes that Jesus' disciples made without making the same mistakes themselves. People may not be able to "go it alone" which means to become a Christian without the aid of the church and the teachings of discipleship may inspire, provide the platform and show modern disciples the way. There are numerous examples of modern day disciples. With people today their lives as disciples may take many forms. Jesus commanded that the good news be spread throughout the whole world and so has been taken up by many Christians. Some feel that they have a vocation, that they have been called to spread the Christian faith as priests, ministers, nuns and monks. ...read more. He gives millions to charity each year and has pledged to distribute and dedicate all his wealth when he dies to charity and try to limit the amount of poverty worldwide. He is setting an example as a modern day disciple learning the lesson courtesy of the story in Mark's Gospel called the rich young man. Bob Geldoff and Bono, their time is currency yet they prove their discipleship in their unstinting dedication to 3rd world charity. This however does not de-mean the stamps my great grandmother collects or the clothes she has knitted for many years for the missions. She indeed has little but gives a lot. In the widow at the treasury we learn of how Jesus regards people who have little but give a huge proportion of their individual wealth to help others. In this story many rich men dropped in lots of money, and a poor old women dropped in "two little copper coins", worth about a penny. Jesus said "I tell you this poor old widow put more in the offering box than all the others. For the others put in what they had to spare of their riches; but she, poor as she is, put in all she had- she gave all she had to live on" Then we have the 'call of the disciples'. ...read more. This was Jesus showing us the path to reconciliation. We can attempt to make right our wrongs. We can tidy that room or apologise and most importantly we should try not to make the same mistake again, as Peter did. Finally we have 'the commission' Jesus last appears to the eleven as they are eating. He is angry with them for not believing in his resurrection but insists they carry on spreading the Gospel. He said "Go throughout the whole world and preach the gospel to the whole human race". Disciples must spread the "good news", they must go out and preach, baptise and face difficulty. Traditionally this is the discipleship of the missionary who have travelled to the ends of the world to bring the Good news. I think however, this teaching needs to be re-applied in the modern western world. Instead of relying on the priest, the Church in Ireland is now looking towards 'lay ministers to spread the 'good news'. Falling numbers joining the priesthood has made it difficult for the Church to combat secularism. This is the modern snake and poison and lay people will be the new disciples. The teachings of discipleship in Mark's Gospel have obviously aided the modern day disciples to the extent that they have followed the same route and have made substantial differences to many peoples lives, just like Jesus intends us to. They have obviously referred to the teachings in Mark's Gospel and applied the lessons to their own lives. ...read more. and some parents may even give up their career to look after their child. Our parents bring us up to be responsible adults in the future, by teaching us moral standards and Christian beliefs. Teachers also do this, by giving up their lives to teach children. to God, but I also think that in terms of disciples today, priests are more in that league, as they are 'in touch' with the people, they have the task of getting people to think about religion, and they have to survive getting mocked, and being shunned. Choice of hobbies could also differ according to the teachings about being a disciple. Whilst one person may concentrate on doing activities that only involve pleasure for themselves, for example clubbing, another person might make time to go and do good things like helping out helping out at a homeless soup kitchen. That tradition of miracles carries on today through the faith and prayer of many Christians on behalf of those who are suffering. Some churches have healing services, offering the "laying on of hands" by a priest or preacher, symbolising Jesus' healing power. they had over, but she from the little she had put in everything she possessed, all she had to live on." Conservative and liberal Christians look for symbolism and the meaning if Jesus' teaching rather than interpreting it literally. They do not think you have to give up everything they have to follow Jesus. She like Jesus believed she was on earth to serve others not herself "Like Jesus we belong to the world living not for ourselves but for others. The joy of the Lord is our strength." Oscar Romero is another example of someone who scarified everything to help others. Disciples are expected to be content with him/herself, and thus have pride, although this does not mean arrogance. Also a disciple must possess the characteristic of happiness and peace with him/herself. Assuming a disciple contains this they will thus be able to recognise others (as well as their own) uniqueness. Jesus means that by denying oneself they must put themselves last in everything, have no care about their own life, and have no desire for rights or privileges, except that of belonging to God. When Jesus said to take up the cross, we can assume that because we all have a cross to bear, we should take up our vocation.